Really the slump started in May. Right around when I started this blog. Coincidence? I don’t know, so I thought I’d find out. Shut it down. Take the Game Golf off the clubs and try to focus on turning the ship around, eliminate distractions. Stop blogging about bad golf. Well… that didn’t work now did it? In my 5 tournament rounds since taking off the tracking, I’ve gone 86-83-80-83-82. At some point you gotta take responsibility for your own golf. The blog / Game Golf didn’t make me start out +8 through 6 holes at La Cantera on the Palmer Course (started on #10). Scared swings on blind tee shots caused that. Nope, it wasn’t the blog that made me double 4 of the last 7 holes on the Resort Course after a pretty good start to get back into the tournament. The hangover surely didn’t help. I’m finding ways to make it harder on myself. The blog didn’t cause me to stumble to +8 on the last 8 holes of TPC Craig Ranch after playing the first 10 holes at EVEN! Nope. Pulled irons and tired swings caught up to me that day. I should have never looked at the leaderboard. The even par start was a little smoke and mirrors aided by a strong putter overcoming balky iron play. Started hemorrhaging bogeys like a stuck pig once the putter cooled down. The blog didn’t force my hand into playing the last two holes at Trails of Frisco in +6. Nope. That was another scared swing and some bad decision making. Finally, I can’t blame the blog for shooting +6 on the last 8 holes at Heritage Ranch. Maybe it was the heat, maybe it was the fact that I only got a few hours of sleep after being up late at a concert and then having to wake up early to take care of my son. Responsibilities as a father don’t care if you stayed up late at a rock show. It’s part of the balance I have to do and I wouldn’t have it any other way. Maybe I lost focus when things weren’t bouncing my way. Either way, I was mentally fragile. You get the point. I shut off the blog. I shut off the shot tracking. I wanted to eliminate distractions… It didn’t work. Those aren’t the distractions that are hurting me. It is scared golf. There is a fine line between playing to your averages or tendencies, and playing defensive or even scared golf. Club goes back and its a “Block” party… by block I mean it was the most anti-left, no-hook swing I could have made. The ball started 50 yards right of my target and was turning more to the right. Wait a minute… back up. I picked a target based on my tendency that gave me room to miss left. But then, standing over the ball, I was afraid to hit it left?!?! This fear was based on one swing that I made weeks ago? That makes no sense. What makes even less sense is that the ball I had hit weeks ago, the one that I was so afraid of repeating… Found the fairway. 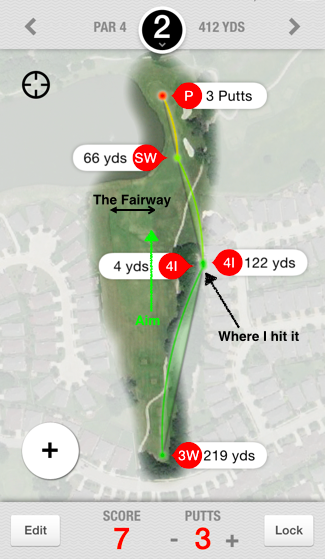 Granted it was on the left side of the fairway and 160 yards to the flag instead of 130… but it was in the fairway. That is what I was afraid of? Repeating that shot? I’d take it now if I could. Look, if I know one thing about golf, its that the subconscious mind is a powerful thing and when it tells you to be afraid of something, you either replace that negative thought, or you are guaranteed to alter your swing in an undesirable way. It will not be free to do what is natural. I know this, so why I keep falling victim to it is silly. In this case, I actually got “lucky”. The kind of “luck” where your ball is in just good enough of a position to make you foolish enough to try to play it, rather than take a penalty. </sarcasm> My ball ended up between a wooded hazard area and somebody’s back yard. Perilously perched on some rocks. I actually had a chance to advance the ball. I didn’t do a particularly good job of that. The poorly executed punch shot was lucky to stay in bounds. Another chop shot got out of the hazard to within 70 yards. Next, a terrible ‘safe’ wedge to 24ft. I can two-putt for a 6. I would have taken a 6. After the tee shot, that would realistically have been a good result. But that’s not what I scored. I scored a 7… How did I turn it into a 7? Was it a difficult 24 footer? No… I left it 3-4 feet short. Tentative. Standing over the 24 footer, the idea of a 7 entered my mind, I was subconsciously worried about the big number. Trying to protect against something worse than a 6. I didn’t want to run this putt 5-6 feet past and have a tough downhiller. I was successful in that endeavor. This kind of thinking is not productive. For one, why am I getting concerned with score on the second hole? Secondly, being afraid of leaving yourself a long second putt is a self-fulfilling prophecy. “Oh man, I don’t want to hit this way too hard” Surprise, surprise… You left it way short. Hard to get a ‘free’ stroke when your mind is drifting to results and score. I know this. It’s a battle I fight. Nonetheless, I had 3.5 feet for my 6. A putt that I make >90% of the time according to my tournament data. But what am I thinking about? I am thinking about an old cup about 2 feet in front of my ball and in my line. It’s a slight depression. The hole plug wasn’t replaced well. Probably several millimeters below the rest of the surface. It’s bothering me. It’s nagging me. I don’t know what it is going to do to the putt. I would normally hit this putt just inside left, placing my path right over the edge of this depression. I pull the putt badly. If the old cup were my target, it was dead center. But the right edge of that cup was my target… and I missed. Turned an easy 6 into an easier 7. That’s a lot of micro-analysis. That’s a lot of thoughts. If you don’t play golf, you probably think I’m crazy. I’m not denying that possibility. The events of the hole I just described took place over a 15-20 minute span. Golf is a game where you certainly have time to think and sometimes that in itself is the enemy. Now before you write me off as a headcase (which I am), I’m not a total loss. I bounced back on the very next hole and made birdie after another terrible tee shot received a friendly bounce from the boundary fence. I put it behind me and played a decent stretch of holes before my next disaster. However, to even have that derailing thought process once in a round can ruin my chances of contending. I have to be better than that. Playing defensive. I’ll spare you the details of the par 5s where I had less than 60 yards in for my third and made bogeys. But it was more scared swings. Those times with wedges. I know better. I know what it takes to play to my potential. Unfortunately I fail to do that repeatedly. Honestly, its just a handful of times I have been able to maintain that clarity. Target focused and confident. Lately its been easily distracted and scared. It’s golf, what is there to be scared of? What is the worst that can happen? You make triple? Quad? I’ve done that plenty playing defensive, so I might as well free-wheel it. 86 (7/12) – La Cantera – Palmer Course… I started on hole 10. After a disastrous start, I played the middle 8 holes at EVEN. There was a lot of good golf in that bad golf sandwich. 83 (7/12) – La Cantera – Resort Course… I played the difficult course at +2 through 10. I was leaping up the leaderboard right up until I thought about exactly that. 80 (6/9) – TPC Craig Ranch… I was even par through 10 holes. A lot of really good golf. 3 birdies in 10 holes. Minimized mistakes early before bleeding bogeys late. 83 (7/12) – Trails of Frisco… +10 on 4 holes. I played the other 14 really well (+2). Mistakes were big, but there is so much good golf in that round. 82 (T7/13) – Heritage Ranch… Fought hard. Had it back to +4 through 10 with a triple on the card. I’m close. I keep telling myself that and I believe it. There is too much good golf in these rounds to throw my hands up in despair. It’s time play like I mean it.